She noted that ENA believes poverty can never be fought by just one person, explaining that that belief is the reason the group works in various areas such as providing potable drinking water, education and adult literacy, medical services, microcredit, eradication of modern slavery among others. Torgbui Avorkli V, Chief of Kuli, who chaired the event, said there was the need for everyone to go to school. He thanked the international NGO for their support to the community and pleaded with the participants to make good use of all that they have learnt. 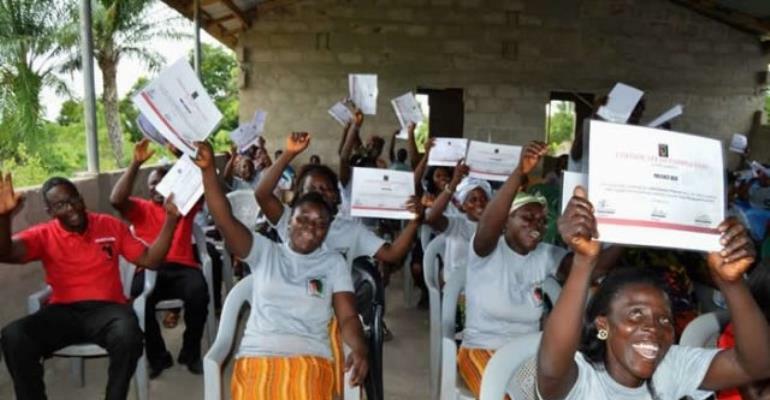 Mr. Dzidodo Agozie, a representative from the Non-formal Education Department of the Education Ministry said, in the olden days, it was very difficult for people to go to school but now things have changed and urged Ghanaians to take it upon themselves to undergo the adult literacy programme. Madam Hannah Appiah, Skills Development Instructor at ENA said she spent about 6 days in training the participants on how to make batic tye and dye, liquid soap, hair pomade and shampoo as part of activities the NGO put in place to improve the lives of its beneficiaries. The beneficiary adult literacy graduates expressed their excitement about the initiative and thanked ENA for making it possible to have a chance towards self-reliance.